Jews banned from ascending one day after a Muslim mob attacked a previous group. Activist: decision "a reward to Islamic terror"
Jewish worshippers hoping to ascend the Temple Mount in commemoration of Tisha B'Av were bitterly disappointed as, once again, police prevented them from ascending. The hundreds of Jewish worshippers who waited Tuesday morning to enter the Temple Mount were turned away by the Jerusalem Police, who informed them that the district commander had ruled that entry to the Mount is forbidden to Jews. The group included Members of Knesset Shuli Mualem-Rafaeli (Bayit Yehudi) and Deputy Foreign Minister Ze'ev Elkin (Likud). Several yeshivot (religious academies) were present as well. Police spokesman Micky Rosenfeld said in a statement that after "security assessments" the decision was made "to close the Temple Mount to all visitors, in order to prevent disturbances." However, it appeared that only non-Muslim visitors were included in that decision. 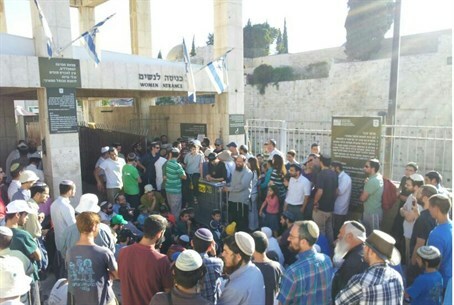 This latest incident comes only a day after a group of Jewish worshippers were forced off the Mount by a Muslim mob, amid claims that the police were failing to protect Jewish worshipper's at Judaism's holiest site. It comes as a national debate rages over freedom of religion on the Temple Mount where, despite its supreme importance to Jews worldwide, Jews are subject to draconian limitations, including a ban on praying, due to the presence of an Islamic complex administered by the Waqf Islamic Trust, and threats by Islamist groups. Tisha B'Av (9th of the Hebrew month of Av) is a day of mourning which commemorates the destruction of the two Jewish Temples in Jerusalem by the Babylonian and Roman empires respectively. The Temple Mount, Judaism's holiest place, is the site of the former temples, and Jewish groups have repeatedly sought to ascend to commemorate their destruction. After being turned away Tuesday, between 100-150 people remained at the foot of the Mount to conduct the traditional Tisha B'Av prayers. "Despite the bitter disappointment and utter disgrace of the police's absurd decision - itself a reward to Islamic terror - to prevent Jews from ascending to the Temple Mount today, the hundreds of Jews who arrived this morning at the entrance to the Temple Mount are testimony to the great awakening taking place within the people of Israel towards the importance of this holy site to our nation. "The sight of so many Jewish men, women and children coming from all over the country at great personal cost and converging on the holy mountain is the clearest indication that the plight of the beleaguered Temple Mount is becoming an important aspect of the national consensus." Speaking afterwards to Arutz Sheva, Rabbi Richman explained that when he first began taking groups to the Temple Mount - 25 years ago - his movement was marginalized. "If you would have asked me back then, I never would have imagined that a Deputy Foreign Minister, and other prominent government figures, would be addressing us as we gathered in our hundreds. "What we saw today was the dedication of men and women of all ages, from across the spectrum, towards the Temple Mount." Rabbi Richman is also the co-host of Temple Talk, a podcast that airs every Tuesday on Israel National Radio's streaming audio cast. The Temple Institute's new Tisha B'Av video The Children Are Ready II has gained about 25,000 views. Others reacted angrily to the ban, including nationalist activist Noam Federman, who slammed the decision as a "grave" one which, in his view, "constitutes a surrender to the Arab marauders, on Tisha B'Av of all days." "Freedom of religion means Jews as well"
Today's events come after another prominent Israeli minister called for an end to the ban on Jewish prayer on the Temple Mount. Deputy Defence Minister Danny Danon insisted that freedom of religion "includes Jews [as well as Muslims]." "We must take steps to ensure that Jews are not only able to visit the Temple Mount, but are also able to pray there. I see no logic in allowing Muslims to pray there, but not Jews. I am committed to this idea,” he added. “We do not need a permit from the Muslim world to for every little thing we do. We do what is best for the Jewish people. It is the job of the police to take all scenarios into account and ensure freedom of worship for Jews at the Temple Mount,"
Photo and video credits: Ben Bresky.